Audiences know that when the lights go off the show will start after actors take their places on stage. But in ‘The Drowsy Chaperone,’ a multi-Tony Award winning musical at Skokie Theatre, the lights stay off while a voice is heard moving closer to the stage. Cast of ‘The Drowsy Chaperone’ at Skokie Theatre. “I hate theater,” says a man’s voice. As he approaches the stage he explains that what he wants is a short show of about two hours. “Three hours is too much,” he says. He notes that he wants the show to take him to another place so he can escape from the horrors of the real world. He wants to be entertained. After the stage lights come on and he sits down in an old chair next to a record player, he asks the audience if they mind if he puts on one of his favorite musicals, ‘The Drowsy Chaperone.’ Of course, the audience agrees. And so, James Spangler who is perfect as The Man in the Chair, has broken down that fourth wall of the stage as he addresses the audience throughout the show. And yes, the musical that he asks the audience to imagine coming to life while he plays his record, is short. Running time is two hours, including a 15 minute intermission. But as The Man in the Chair requested, the show entertains. A spoof of 1920s musicals populated by predictable characters, it has a Broadway producer and his ditsy girlfriend, gangsters, a talented musical star who will leave show business for love, her wealthy boyfriend, a Latin lover, an alcoholic dame and an aviatrix. Across his sparse, care-worn flat, the first characters to appear are Mrs. Tottendale (Debby Shellard), owner of the mansion where the action takes place and Underling (Mark Anderson), a butler who caters to her whims. After wondering why she has on a fancy dress, he explains they are hosting a wedding. Groom Robert Martin (Christopher Johnson) enters saying he may be getting “cold feet.” When followed by best man, George (Joe Lewis) the two do a terrific “Cold Feet” tap dance number. The plot, as is appropriate for spoofs, thickens. Broadway producer Feldzieg (Bob Sandders) is confronted by The Tall Brothers gangsters (Zeke Dolezalek and Connor Hernandez), who pose as bakers and say their boss, a backer, seriously doesn’t want the show‘s star to wed and leave the production. Feldzieg’s girlfriend, Kitty (Abby Boegh), says she’s ready to step in with a different kind of act when the star and bride-to-be, Janet Van De Graff (Rachel Whyte) leaves to marry. Asked if she is serious bout leaving show business, Whyte brings down the house with her “Show Off” song and dance, full-company number. While showing off everything she can do including splits she insists she doesn’t want to “show off” anymore. Beautifully choreographed by Julie Salk and performed with acrobatic agility by Whyte, the surprise it that the number can be performed on the Skokie Theatre’s small stage. Convinced his star does mean what she says, Feldzieg plots to change her mind by bringing in Adolpho, nicely overacted with the right amount of flamboyancy and vanity by Sean Barett. Adolpho is sent to the bride’s room where he finds The Drowsy Chaperone, interpreted with zestful fun and sophistication by Mani Corrao. Meanwhile, the bride tests the groom to see if he really loves her. Act II brings resolution. It also brngs Trix the Aviatrix, played with pizzazz by the Sabrina Edwards, down to ground to perform a quadruple wedding. Along the way, the audience is reminded that they are merely seeing a musical as explained by the Man in the Chair when he pauses the record player needle and the actors stop mid-movement, or when he has to correct the needle when it sticks. Yep, picture it. Patty Halajian’s costumes add nostalgic charm. 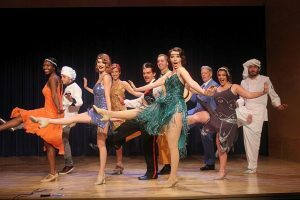 Directed by Stephen M. Genovese with musical direction by Aaron Kaplan, the Skokie Theatre’s The Drowsy Chaperone, offers a delightful, high-quality, tongue-in-cheek view of 1920s musicals. DETAILS: ‘The Drowsy Chaperone’ is a MadKap Productions show at Skokie Theatre, 7924 Lincoln Ave., Skokie, now through Oct 7, 2017. For tickets and other information call (847) 677-7761 and visit Skokie Theatre.